Did Octopizzo Lie About His Collabo? Find Out! The leading Hiphop rapper in kenya, Henry Ohanga populary Known as Octopizzo came out a few days ago to claim that he did a collabo with popular singer Alsina. After the claim, Octopizzo's fan who were super excited at the time took it to social media to support the artist and wish him the best as he goes international. Little did they know that Octopizzo played them a trick like our famous local Pastors, trying to reap where they have not sowed. 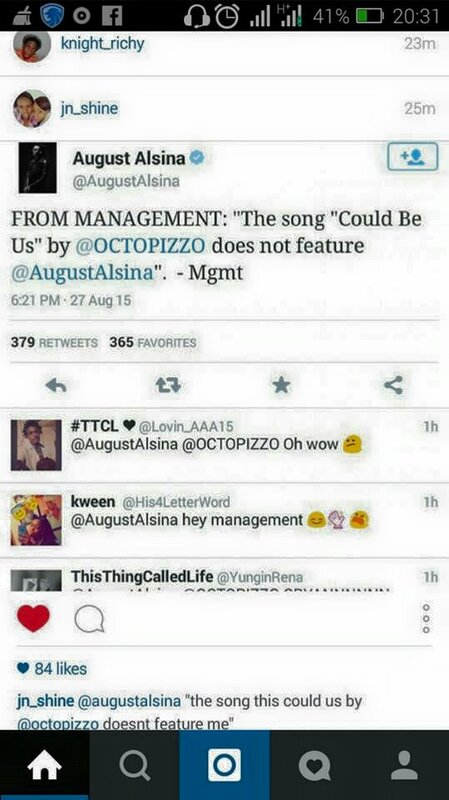 Through August Alsina's official twitter handle, Octopizzo did not in anyway collaborate with the singer which poses the big question as to why he lied about the collabo. Octopizzo had everyone talking when he dropped a video teaser for the upcoming collabo and his fans were excited about it.